If you want to avoid crushing your homemade bagel sandwich on the way to work, store it in a CD spindle case. Tired of stealing ketchup packets from food courts? Place your sauce or dressing of choice in a contact lens case for easy single-serving condiments. To keep your lunch salad from getting soggy by noon, make sure to place a dry, folded paper towel on top of your salad before placing the lid on the container. You can also prevent apples from browning before lunchtime by slicing them, reassembling the pieces, and holding it all together with a rubber band. 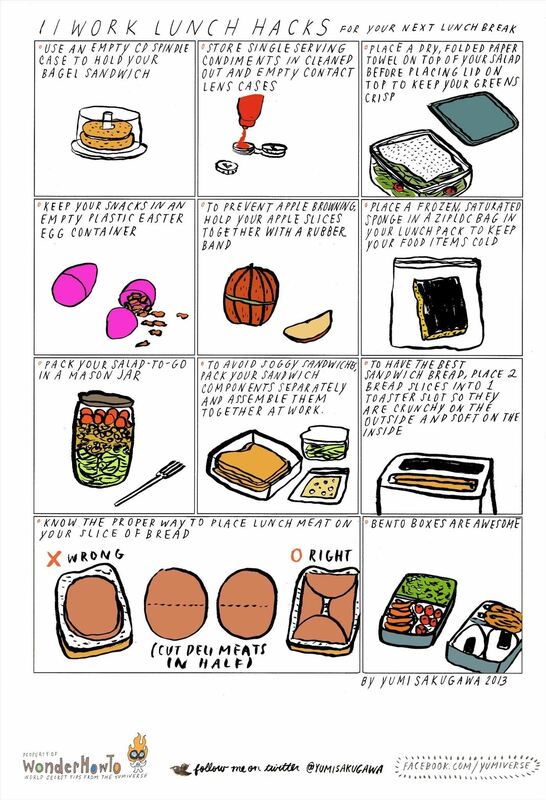 Got your own secret work lunch hacks? Share with us.